In recent years, Gloucester Catholic has maintained the tradition of distributing most of the senior awards during a formal breakfast on the morning of commencement; the Bishop Dennis Sullivan Award is the only award distributed during commencement exercises. 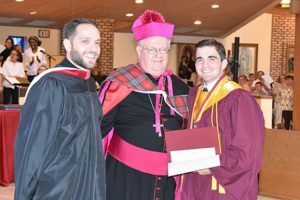 Bishop Sullivan, it is now my privilege to describe to you the student who is this year’s recipient of the Bishop Dennis Sullivan Award. — I’ve seen that this student values being right with God and with others. — This student is admired by his peers and adults alike. — This student is always willing to lend his considerable talents to those around him. I’ve seen him play soccer, where his strong fundamentals and sense of teamwork may have gone unnoticed at times, but he was happy to help his teammates excel. — I’ve seen this student show up exactly on time more times than I can count — not a split second early, but exactly at the very last moment — and I’ve discovered that I can rely on him. However, as a new member of the Gloucester Catholic community, I have also had to rely heavily on the reports of others, and so I am also happy to report what I have heard about this student. — From a veteran teacher, “Easily one of the top 10 students I’ve ever taught.” This, after taking her AP history class as a junior. — A record of service which includes ongoing work with the Knights of Columbus and Saint John of God School. So, what have I seen and heard? A student in whom Jesus is alive, and through whom Jesus shows his love and friendship to others. A student who has shared the love of Jesus with me, and helped me to grow in my knowledge of the love of God. I have seen and heard Jesus in this young man. There are many students at Gloucester Catholic about whom any one of these qualities could be said, but only one student about whom all of these things can be said. There are many awards being given out at this time of year, but only one award which is given out here, during commencement. There are many members of his family who have walked the halls of Gloucester Catholic, but there is only one Danny O’Shea.